Who as a child has not wandered through a cornfield and suddenly found themselves lost, disoriented, fearful, on the verge of panic? The wind turns cold, the sun blinds, leaves tickle like witch's finders, shadows dance like monsters stalking, the endless whistling rustling seems hostile and empty. But what does it actually mean to be lost? It is certainly a failure of cognition wherein outside sensory input mismatches preconceived expectations. But not every instance of mismatch causes disorientation or provokes panic. Two factors mitigate, I think. First, what is at stake? If your life or career is in jeopardy, the stakes are high and panic is very likely. But if the stakes are low, say if the bookmark has fallen out of the novel you are reading, you may very well get angry but you would not likely panic. The second factor, I'd suggest, is whether or not you have a readily available plan for recovery. 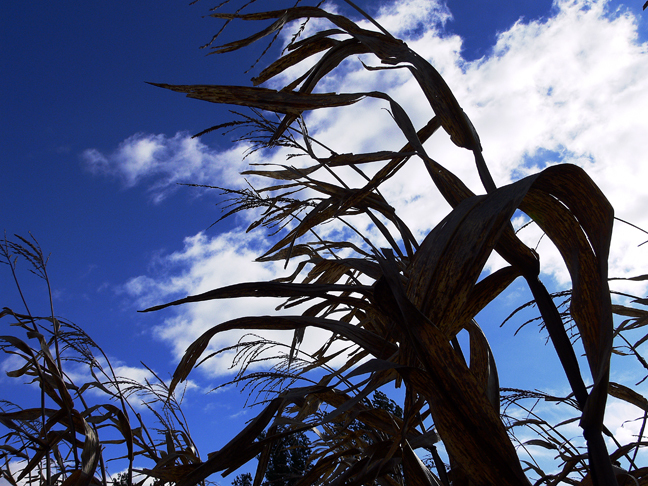 A child lost in the corn would likely not have such a plan for finding his or her way back to safety. Hence, tearful panic would result. But an adult with the experience of having gotten lost many times before might very likely know a variety of techniques for finding his or her way to safety. There is another case, however. And I am here reminded of a recent conversation with a 26 year veteran of the U.S. military wherein he related his recent conversation with a young woman on the mend from her most recent tour in Iraq. From mid-thigh downward, she was getting used to an artificial limb. And doing quite well, able to run the hundred in surprisingly reasonable time. She was also aching in the worst way to go back to Iraq. He asked why? Her answer: she'd lost a brother over there and the job wasn't done yet. That young woman was experiencing disconnect of the most intense kind. Stakes were high, but she had a plan for recovery. The remarkable thing was the military was quite encouraged by her progress and were very likely going to allow her return to duty. The 26 year veteran could not help thinking of all the guys from his generation and Viet Nam who were never given chance to recover and return to duty like she was going to get. Their disconnect was permanent, unalterable. And the train wreck that resulted in their lives was inevitable. "It's in the personality," he said. "Willing to go through hell, then to be denied? It's more than some could take. This generation, some at least, like that young woman, are gonna get opportunity to complete their mission. For a soldier, there ain't nothin' better."